Every action counts! 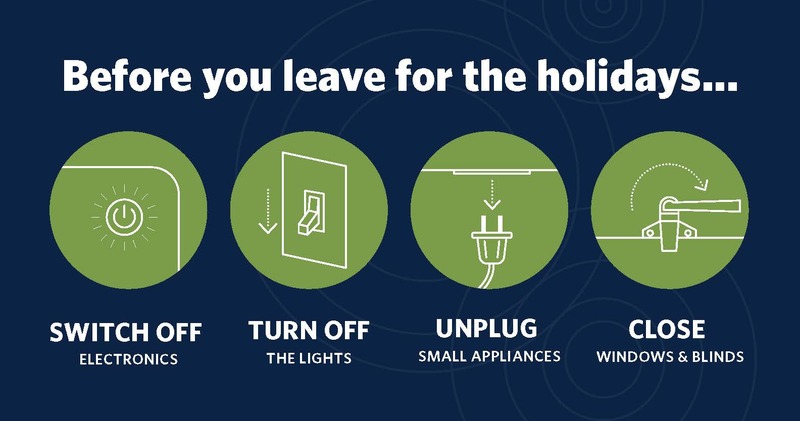 This holiday season help save energy as part of UBC Okanagan’s Seasonal Shutdown, which lowers the temperature in buildings during the winter break to reduce energy use and emissions on campus. Simple actions like turning off and unplugging electronic equipment and turning off lights conserves energy and reduces emissions. Help us save even more energy this year by completing some simple actions and filling out the Shutdown Checklist! Identify a person(s) to complete a final review before the holidays and submit the checklist on behalf of your office to stephanie.french@ubc.ca by December 24 to be entered to win a $100 prize for your department. Help promote Seasonal Shutdown in your unit. Download Poster. Visit Bundle Up! to view more ways to beat the winter chill. Download and complete the checklist for your office or lab in collaboration with your colleagues. Submit one checklist per office/department/floor/wing etc. Checklists must be completed and submitted to stephanie.french@ubc.ca prior to winter break (i.e. December 24) to be eligible for the prize draw. Completed entries will be eligible for the prize draw to win a $100 prize for your office/department. The winner will be announced in January 2019. Yes. UBC Okanagan’s building temperatures will be adjusted to reflect occupancy levels during the holiday break, as approved by building managers and facility managers. The majority of the energy consumed in academic and administrative buildings is due to heating, ventilation and cooling (HVAC) systems. By turning down the heat when the building is not in use we can prevent the unnecessary loss of significant energy and reduce both costs and greenhouse gas emissions. If you are too hot or too cold during normal operating hours, before you plug in a heater or a fan we need you to tell us if something doesn’t seem typical for your building. Contact Facilities Management to report the issue. If you spot any leaky faucets, showerheads or toilets at UBC, please contact the Facilities Management online to report the issue. Where can I learn more about UBC Okanagan’s climate and energy conservation initiatives? If you have additional questions about Seasonal Shutdown, contact stephanie.french@ubc.ca.